With wry wit, deep insight, and vivid anecdotes, Tim McHugh gives voice to the family pet and delves into the place where the canine and human hearts become one. Ivan, a mixed-breed dog-philosopher with an extreme underbite and various other deformities, chronicles his life story with keen observations about his adopted family and the people he loves, covering the life events that touch us all. Throughout his life Ivan keeps plugging forward with optimism and faith, always striving to learn from his mistakes, believing that even as he is ultimately facing old age, disease, and death, life is all the more wonderful. To Ivan, love and relationships with people are what matters most, and that if a deformed pound dog like him can find love and acceptance, anyone can. His is a lively, humorous story of hope and perseverance. 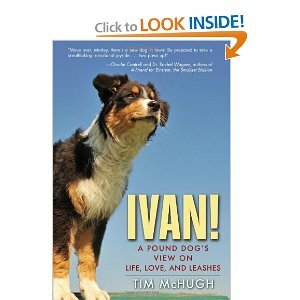 Tim McHugh has given his one of a kind dog Ivan a voice - I came away from this book inspired. I truly felt I was reading Ivan's thoughts - his joys, his fears, his pain, his incredible capacity to love and comfort. I've always known animals had more strength and courage than humans - they accept the hand they're dealt without complaint and live their lives with quiet dignity. This is particularly so with shelter pets - once you save them, they will devote the rest of their lives to taking care of and loving you. Please read this pound puppy memoir; adopt your next best friend from your local shelter; and visit www.foreverivan.com to learn more about (and to see more adorable pictures!) of this special little angel with fur.